The Americans with Disabilities Act (“ADA”) is a civil rights law that applies to QuikTrip facilities and services. 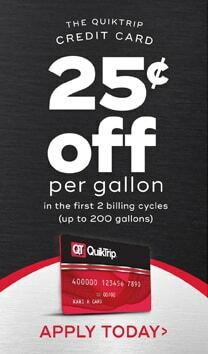 It guarantees equal opportunity and access for individuals with disabilities to QuikTrip facilities, including gas stations, convenience stores, truck stops, and travel centers (collectively “QuikTrip Stores”). The ADA requires QuikTrip facilities to be accessible to individuals with disabilities. It also requires QuikTrip to provide customers with disabilities an equal opportunity to benefit from our goods and services. It is QuikTrip’s policy to make all changes necessary to ensure that QuikTrip Stores are accessible to and usable by customers with disabilities. It is QuikTrip’s policy to provide its customers with disabilities with the same services and assistance that it provides to all customers. QuikTrip will also modify its policies and procedures to provide additional assistance on request to customers with disabilities who may need that assistance to access our goods, services, and facilities. Common types of assistance that QuikTrip provides to customers with disabilities include the following: providing fueling assistance when more than one employee is on duty; cleaning windshields; opening doors; locating or retrieving merchandise; carrying merchandise to a customer’s vehicle, reading product labels or prices; helping customers with vision disabilities find their way around our facilities, and providing assistance in operating beverage dispensers, food service equipment, and credit/debit card payment mechanisms. Further information about the ADA can be obtained by calling the Department of Justice’s toll-free ADA Information Line at 1-800-514-0301 (voice), 1-800-514-0383(TTY). QuikTrip Stores and any other QuikTrip facilities open to the public do not discriminate against any individual on the basis of disability in the full and equal enjoyment of our facilities, services, and products. If there are any questions or problems regarding service or the accessibility of any QuikTrip facility, please contact the store manager or call QuikTrip at 1-800- 441-0253 or contact QuikTrip’s ADA Coordinator at 918-615-7937 or mthornbr@quiktrip.com. If the individual responds that the animal is required because of a disability and has been trained to perform some work or task, we will welcome the person and service animal into the store. Once an individual with a service animal has answered this question, we will not ask any further questions about his or her service animal. We will not ask an individual questions about his or her disability. We will not ask an individual to show a license, certification, or special ID card as proof of their animal’s training. We must permit service animals to accompany individuals with disabilities to all areas of our stores normally used by customers or other members of the public. We treat individuals with service animals with the same courtesy and respect that QuikTrip affords to all of our customers and to other members of the public who visit our stores. Service animals are not pets. Employees must not interfere with the important work performed by a service animal by talking to, petting, or otherwise initiating contact with a service animal. In the event that a particular service animal’s vicious behavior poses a direct threat to the health or safety of others, QuikTrip has the right to exclude the animal from our store at that time. Barking or growling alone is not a direct threat. In addition, a direct threat does not exist if the service animal’s owner takes prompt, effective action to control the animal. Moreover, we will not exclude a particular service animal based on past experience with other animals or based on fear that is not related to an individual service animal’s actual behavior. Each situation will be considered individually. In the event QuikTrip excludes a service animal because of a direct threat, we will not refuse service to the individual with a disability when he or she is not accompanied by that particular service animal. Only the Manager on Duty can make the decision to exclude a service animal because it poses a direct threat. Any inquiries about this policy, or complaints about the implementation of the policy at an individual store should be referred to the ADA Comment Line 1-800-441-0253 or to QuikTrip’s ADA Coordinator at 918-615-7937 or mthornbr@quiktrip.com. Further information about the ADA can be obtained by calling the Department of Justice's toll-free ADA Information Line at 1-800-514-0301 (voice), 1800-514-0383 (TTY). If there are any questions or problems regarding service or the accessibility of any QuikTrip facility, call QuikTrip at 1-800-441-0253, or contact QuikTrip's ADA Coordinator at 918-615-7937 or mthornbr@quiktrip.com.